This deployment guide presents a high-level overview of VMware App Volumes. It describes App Volumes capabilities, architecture, and implementation requirements and addresses frequently asked high-level questions about deploying an App Volumes solution. App Volumes is a real-time application delivery and lifecycle management tool. Enterprises can use App Volumes to build real-time application delivery systems that ensure that applications are centrally managed. Applications are delivered to desktops through virtual disks. There is no need to modify desktops or applications themselves, and the App Volumes solution can be scaled out easily and cost-effectively, without compromising end-user experience. 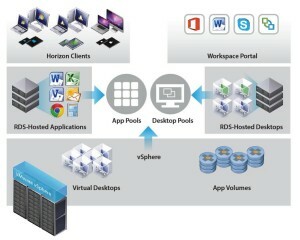 App Volumes complements the VMware End-User Computing portfolio by integrating with existing VMware Workspace Portal, application, and desktop solutions.